With Gwen Sharp, PhD, Lisa is the founder of Sociological Images, a site to which she continues to contribute. Designed to encourage the public to exercise and develop their sociological imagination, the site presents brief discussions of compelling and timely imagery that span the breadth of sociological inquiry. Lisa was the site’s principal author and editor between 2007 and 2017. With an archive of over 5,000 posts, the website became the most highly-trafficked sociology-based site on the web and reaches into the blogosphere with fans, friends, and followers on tumblr, twitter, facebook, and pinterest. It is used as a source by a wide range of news organizations, are routinely cross-posted at high profile news and opinion sites. 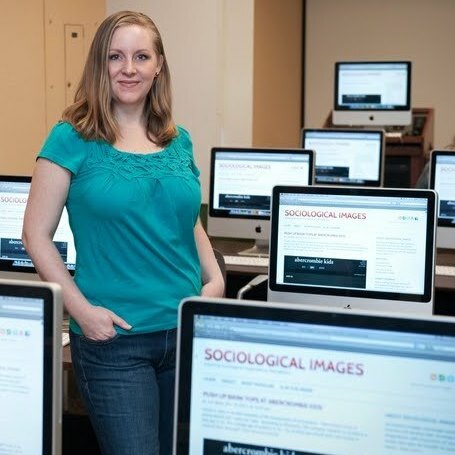 While Sociological Images has a wide array of readers, it is also a teaching resource. In addition to timely material for courses, we offer short essays, images guides, and sample assignments. It has been reviewed favorably in Teaching Sociology and Visual Studies, featured in an article published at Teaching in Higher Education, and have been granted awards from The American Sociological Association, The Pacific Sociological Association, the American Sociological Association section on Communication and Information Technologies, Contexts magazine, the University of Minnesota Department of Sociology, the Mellon Foundation, and the Multimedia Educational Resource for Learning and Online Teaching. In the summer of 2017, Lisa handed over editorship of the site to the sociologist Evan Stewart.